Dan Malloy: Free birth control coverage. Eric Holcomb: $250-million Next Level Indiana Trust Fund. Ralph Northam: Look harder for diverse candidates for leadership roles. Kay Ivey: Held first ever Governor's Disability Job Fair. John Bel Edwards: Provide regulatory relief for small business. Chris Sununu: Lower business tax to accompany no income or sales tax. Chris Sununu: 3-phase deregulation to help business. John Hickenlooper: Fund $10M program to support rural business. John Hickenlooper: 5-year initiative to support startup businesses. Phil Bryant: Growing business is best jobs program. Ralph Northam: Raise threshold for felony larceny; 2nd chance after mistake. Susana Martinez: Increase penalties for many crimes. Nathan Deal: Accountability courts fight recidivism. Chris Christie: Bail reform based on crime, not wealth. Chris Christie: Expunge records for less serious crimes. Jay Inslee: End the death penalty. Kay Ivey: More prison staffing and more capital investments in prisons. Charlie Baker: Reduce opioid prescribing and drive Fentanyl off our streets. Gina Raimondo: Jobs and insurance, to combat addiction. John Hickenlooper: National model for marijuana legalization. Chris Sununu: Give parents choice instead of one-size-fits-all system. Kate Brown: Future Ready Oregon: Prepare students for today's jobs. Doug Burgum: Local control of schools. Gina Raimondo: More pre-K classrooms; free community college. Gina Raimondo: Major investment to repair crumbling schools. John Hickenlooper: Increase investment in education by additional $100M. John Hickenlooper: Schools should focus on skills for future jobs. Jay Inslee: Four-year degree isn't the only path to success. Kay Ivey: Strong Start, Strong Finish: from pre-K to workforce. Phil Bryant: Parents should have school choice. Dan Malloy: Aggressively pursue clean energy. Doug Burgum: On energy, all of the above. Bill Walker: Increased oil production key part of energy policy. Gina Raimondo: Green energy means jobs. Phil Murphy: Protect our precious Jersey Shore from offshore drilling. Ralph Northam: Create clean energy jobs in rural communities. Terry McAuliffe: Cap carbon emissions from Virginia's electric utilities. John Hickenlooper: Close coal plants: cleaner air AND lower utility bills. Jay Inslee: Supports carbon tax. Andrew Cuomo: Pro-active policy to protect groundwater. Phil Murphy: We all can contribute, including the differently abled. Peter Ricketts: Exports boost Nebraska economy. Ralph Northam: End unnecessary restrictions: no-excuse absentee ballots. Jay Inslee: Favors automatic voter registration. Kay Ivey: Ban lobbyists from appointments by the executive branch. Mark Dayton: Commonsense criminal background checks to all gun purchases. Chris Sununu: Protect schools with security infrastructure. Dan Malloy: Close loopholes; ban bump stocks. Dan Malloy: Allow early voting, explore vote by mail. Ralph Northam: Start with universal background checks. Jay Inslee: Pass common-sense gun laws. Kay Ivey: Firearms industry jobs part of rich history of 2nd Amendment. Mark Dayton: MinnesotaCare Buy-In: affordable choices for consumers. John Bel Edwards: Medicaid expansion addresses opioid crisis. Chris Sununu: State must invest in mental healthcare system. Dan Malloy: Healthcare a fundamental right. Charlie Baker: Health Connector: replace mess with hope. John Hickenlooper: ObamaCare not perfect; it has helped but needs improvement. Dennis Daugaard: Add work requirements to Medicaid. Eric Holcomb: Must reduce infant mortality rate. Phil Bryant: Medicaid patients are responsible for bad choices. Doug Burgum: Need strong deterrent against rogue nations. Chris Sununu: Supports DREAMers; reform immigration laws. Gina Raimondo: Opposes deporting DREAMers. Jay Inslee: Scholarships for DREAMers. John Bel Edwards: Equal pay for women; enact minimum wage. Bill Walker: Address state economic recovery with jobs program. Ralph Northam: Strengthen workforce development and expand apprenticeships. Nathan Deal: Full funding for technical education for jobs. Phil Bryant: Mississippi Model: Cutting red tape increases jobs. Phil Murphy: Reject Pres. Trump's dark belief of an America in decline. Ralph Northam: Do good; be transparent; look for better ways. Kay Ivey: Guide ship of state through storm of governor's resignation. Kay Ivey: Listen, Learn, Help and Lead tour, to restore confidence. Charlie Baker: Make Massachusetts the most age-friendly state in the nation. Gina Raimondo: Cut tax on Social Security payments. Mark Dayton: Raised taxes only on top 2%, not the other 98%. Phil Murphy: Stronger & fairer funding instead of massive tax breaks. Rick Scott: Supermajority for any tax increase. Phil Scott: Balanced budget without raising taxes. Charlie Baker: Hundreds of millions to fix decades of neglect on the MBTA. Charlie Baker: High speed wifi in Western Massachusetts. Karyn Polito: Build out high-speed internet via local partnerships. 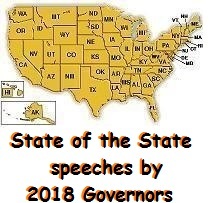 The above quotations are from 2018 Governor's State of the State speeches.